My first attempt… I’ve procrastinated too long with the fear that the project is doomed to fail. Well, it’s about time to charge ahead, equipped with my gardening instincts with confidence. I’ll never know unless I try, don’t you think so? Currently our potted Staghorn Fern (Platycerium bifurcatum) amazes us with its spectacular display. It now has 5 juvenile pups to complement its elegant beauty, with luscious fertile fronds that fall downwards beautifully in a fountain-like manner. Observing it closely, I feel it’s just the right time to remove one of its pup to experiment propagating the Staghorn Fern. 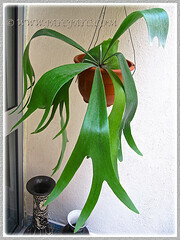 And, the lone pup that sits right at the top will be the best candidate in my opinion… I don’t think its removal will spoil the beautiful look of our Staghorn Fern. Photo on the left affirms its continuing elegance. Platycerium (Staghorn/Elkhorn Ferns) are fascinating tropical and subtropical epiphytes that grow on tree trunks in the wild. 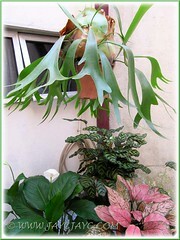 However, they are widely cultivated as ornamental plants in the home environment for its attractive staghorn- or elkhorn-like fronds. An easy-to-grow fern that needs minimal maintenance and will be a lovely conversation piece in any garden. To propagate, you can either remove the pups that are produced by a matured plant or the spores produced by its fertile (foliar) fronds, though the preferred method by home gardeners is the former. 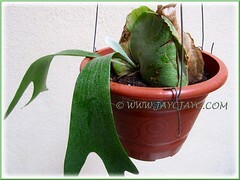 The pups of the Staghorn Fern can be grown in hanging baskets/pots or mounted onto a tree branch, dead log or a wooden board. Whatever, I’d love to demonstrate here on how to grow one in a hanging pot. 1. Identify the pup or plantlet that you want removed from the parent plant and ensure that it has at least 3 fertile fronds (the staghorn-like fronds) for better survival. 2. Prepare a small 6-inch plastic hanging pot. To hang, referably use wires that are more reliable than the plastic-made ones which may snap over the years. Line the pot base with pot shards for better drainage and gravity. Then fill it three-quarter way with peat-based potting medium, mixed with something light like coconut fiber, padi husk, etc. Water thoroughly. 3. Now to remove the pup together with its root system. 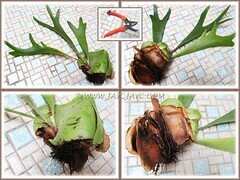 The roots are in the basal fronds, so use a sharp knife or pruning shear to cut through the thickened layers of old and new basal fronds, being careful not to damage its rhizome and the growing bud which is its life source. Best to cut at least a couple of inches away from its growing point as illustrated in image above. Gently remove the pup, together with its root system. 4. Next is to plant the pup. 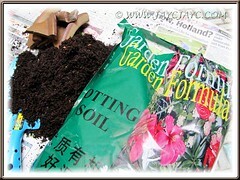 Use a spade to create a central hole in the potting mix. 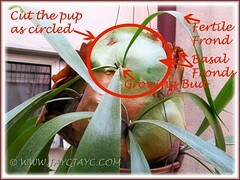 Nestle in the pup with its root system and the lower basal fronds into the potting medium to hold it down. Be mindful that the growing bud is raised about 1 cm above the soil, and slightly tilt the pup backwards so that the growing point at the back is just below the soil surface. Firm the soil around the pup and water lightly if you’ve added additional soil. 5. Hang the newly potted pup in a shaded area with filtered sunlight. Water lightly if the top soil surface is dry to keep it moist or mist the pup lightly every other day. The basal fronds and root system will eventually expand and clasp the growing surface. Also, the fertile frond that emerged from the growing bud will lengthen to show that it’s fine and happy. That is all to it! Quite simple and easy, right? Yay!! 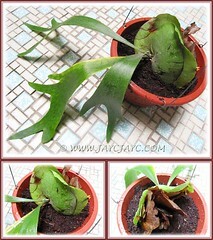 I’d love to share that my experimental project on propagating a Staghorn Fern as illustrated above was a great success. Photos below show the successful story. A new fertile frond had emerged, measuring 6cm long on the 11th-day after propagation. And, the growing bud looks healthy and promising. My darling John and I are overjoyed at the outcome. Removal of a pup and mount it onto tree trunks or branches, dead log or onto a wooden board To mount, place some moistened sphagnum moss or similar moss at the back of the basal fronds, then fix them onto the mount with encircling fishing line, thin wire, twine or nylon pantyhose, being careful not to damage or tie over the growing bud where new frond emerges. 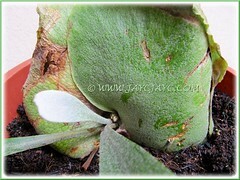 The basal fronds and root system will eventually expand and clasp the growing surface. Check out this site with illustrated mounting instructions. From spores that are produced on the underside of the fertile or foliar fronds. A choice not favoured by home gardeners. You can learn how to propagate from spores from an article at the Australian National Botanic Garden, if you’re interested. We’re absolutely thrilled to see the progress of our potted Platycerium bifurcatum that was propagated almost 3 years ago. Though slow-growing, we’re extremely happy with its beautiful display. great detailed instructions – I have quite a few elkhorn plants on the trunk of my lychee tree. I am not sure I want to remove any, but it is nice to know that it can be done. I hope you are both doing well. I really never thought of this. Often times I took it as the whole fern frond is actually one unit until you mentioned it here. Personally – the cutting and removing the frond seemed scary as I truly not sure what not to cut – as you say – not to cut or damage its rhizome. I often admire this fern from the nursery or seeing them in some gardens. They seemed to take a lot of space. I had spotted a nursery in Sg.Buloh selling this ferns and when it actually came – it was without a wire – the workers where fastening the wire on these ferns. I’m still thinking of getting this in my garden. Hoping that I can find one thrown out – left dying somewhere and me rescuing it. That would be some experience. @ James: I was as fearful as you initially when trying to cut and remove the pup. Hope the illustrated images at Step 3 above will be helpful when the need arises. 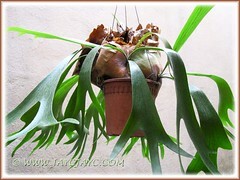 All the best in adding a Staghorn Fern to your garden. I think it’ll like your shady garden, mounted on an old log or on PVC pipes as you did for your orchids. this has been the best instructions and photos and labeling I have found. Thank you. You’re most welcome, Azeo… our pleasure in sharing. I have taken 2 pups from my mother plant and the first one lost its frond, now has slight signs of a new one developing but it just looks like a bud, and now it’s been several months and no growth? What can I do? I had it mounted to a board with sphagnum moss. I have now moved it to a hanging basket with peat moss to see if that helps>> its hanging right next to the mother plant so it has the same light conditions?? Can it be rescued?